Description: This is a set of 7 Original Little People family figures. The set includes a dad, mom, two boys, two girls, and a dog. The first few years this set was made, all of the figures were made of all wood. 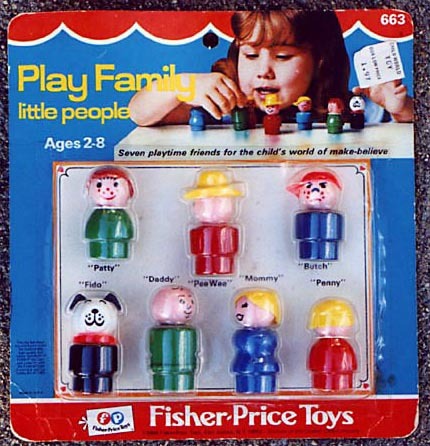 During the early to middle seventies, the figures had a wood body with a plastic head. From about 1976 to 1977 onward, the figure were made of all plastic. This set had a variety of variations throughout it's production, including such uncommon figures as a dog with a blue collar, and a mom with a purple wooden queen's body. FIWW - Blue mom with fancy eyes, and white hair in a bun. AJWW - Blue boy wearing a red cowboy hat. DOWW - Red boy, Butch, frowning, freckles, wearing a yellow sideways baseball cap. FTWW - Green girl smiling with freckles, ''' eyebrows, and a red bob with bangs. IVWW - Regular-sided Lucky dog with a metal rivet between his ears, and wearing a red collar. The collar has small dots on the outside edges. DOWW - Red boy, frowning, freckles, and wearing a yellow sideways baseball cap. FTWW - Green girl with freckles, ""eyebrows, and a red bob with bangs. GNWW - Red girl with blonde braids. HUWW - Straight-sided Lucky dog with a metal rivet between his ears, wearing a red collar. The collar has small dots on the outside edge. ACWW - Blue boy frowning, freckles, and wearing a red sideways baseball cap. DQWW - Red boy smiling, wearing a yellow cowboy hat. FVWW - Green girl smiling with freckles, ""eyebrows, and red braids. HVWW - Straight-sided Lucky dog with a metal rivet between his ears, and wearing a yellow collar. The collar has small dots on the outside edge. FIWW - Blue mom with fancy eyes, and a white bun. DQWW - Red boy, smiling, wearing a yellow cowboy hat. KJWW - Straight-sided Lucky dog with a metal rivet between his ears, and wearing a red collar. The collar has lines on the outside edges. HRWW - Straight-sided Lucky dog with a metal rivet between his ears, and wearing a white collar. The collar has dots on the outside edges. FIWW - Blue mom with fancy eyes and white hair in a bun. AJWW - Blue boy, smiling, wearing a red cowboy hat. DOWW - Red boy frowning, freckles, wearing a yellow sideways baseball cap. GNWW - Red girl smiling, with blonde braids. HVWW - Straight-sided Lucky dog with a metal rivet between his ears, and wearing a yellow collar. The collar has small dots on the outside edges. FIWW or FIWP - Blue mom with fancy eyes and white hair in a bun. AJWW or AJWP - Blue boy, smiling, wearing a red cowboy hat. DOWW or DOWP - Red boy, frowning, freckles, wearing a sideways yellow baseball cap. GNWW or GNWP - Red girl smiling, with blonde braids. ACWW or ACWP - Blue boy, frowning, freckles, wearing a red sideways baseball cap. DQWW or DQWP - Red boy, smiling, wearing a yellow cowboy hat. FVWW or FVWP - Green girl smiling with freckles, "" eyebrows, and red braids. GMWW or GMWP - Red girl, smiling, blonde bob with bangs. HWWW or HWWP - Regular-base Lucky dog wearing a red collar. The collar has lines on the outside edges. ACWP or ACPP - Blue boy, frowning, freckles, wearing a red sideways baseball cap. DQWP or DQPP - Red boy, smiling, wearing a yellow cowboy hat. LAWP or LAPP - Green girl with freckles, "" eyebrows, and a brown scultped bob. HXWP or HXPP - Regular-base Lucky dog with a blue collar. The collar has lines on the outside edges. ACWP or ACPP - Blue boy, frowning, freckles, and a red sideways baseball cap. HWWP or HWPP - Regular-base Lucky dog with a red collar. The collar has lines on the outside edges. JTWP - Deep purple mom with fancy eyes, and a blonde ponytail. ZBPP - Orange girl with a blonde bob with bangs. HWWP or HWPP - Regular-base Lucky dog wearing a red collar. The collar has lines on the outside edges. DQPP - Red boy, smiling, wearing a yellow cowboy hat. EWPP - Yellow boy, frowning, freckles, and a red sideways baseball cap. LAPP - Green girl with freckles, "" eyebrows, and a brown scultped bob. GMPP - Red girl, smiling, with a blonde bob with bangs. HWPP - Regular-base Lucky dog with a red collar. The collar has lines on the outside edges. IRPP - Turquoise boy, smiling, wearing a yellow cowboy hat. 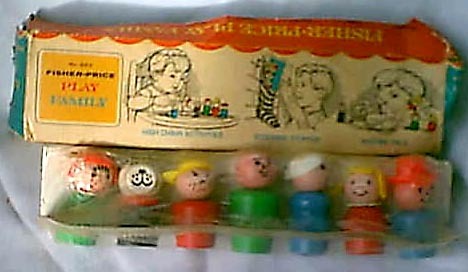 1966-1970 - This set was sold in a box that has a clear plastic window on one side, a red top, and a blue bottom. The red and blue were divided by a white scalloped line, similar to the Fisher-Price logo. 1971 onward - This set was sold on a blister card opposed to in a box.